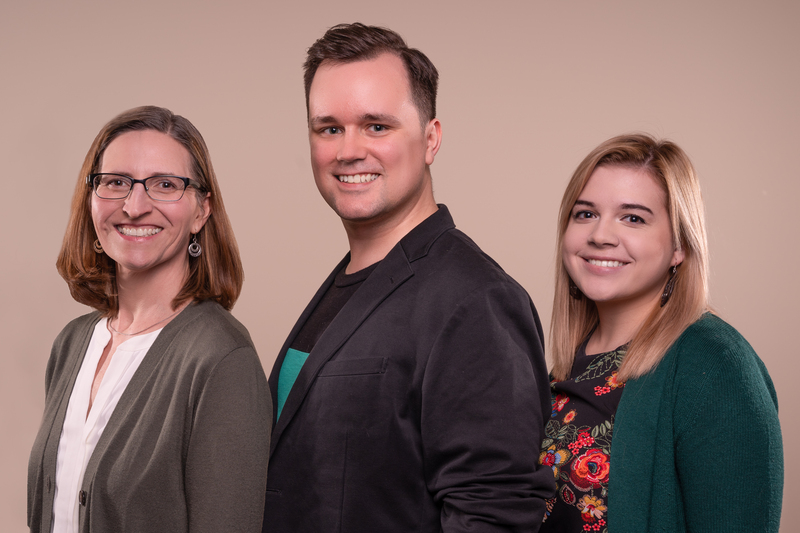 The 2019 Arts Midwest Conference team includes Conference Co-directors Angela Urbanz and Brian Halaas, and new Program Associate Carly Newhouse. Photo by Joshua Feist. It may still be 2018, but we are moving full steam ahead on developing next year’s Arts Midwest Conference! From site visits to building next year’s showcase panels, we’re already working hard to make the 2019 Conference in Minneapolis, Minnesota an event to remember. There are some big changes on the Conference team this year. We are pleased to announce that Conference veterans Angela Urbanz and Brian Halaas will be co-directors! Angela will serve as the Director of Operations and Planning and Brian’s role has been expanded into a new Director of Programming and Communications position. We are also excited to announce that recent hire Carly Newhouse is coming on as a program associate to support Conference operations and planning. Angela is responsible for planning and operations of the Arts Midwest Conference. Her responsibilities include include co-developing the over-all conference plan, managing venue and vendor relations and logistics, managing Conference staff, and managing the Conference budget. Brian is responsible for the Conference’s programming and communications. His responsibilities include co-developing the over-all Conference plan, developing conference content and professional development activities, directing registration, managing the Conference Spotlight Showcase, and directing promotions and on-site communications. Carly Newhouse will be supporting operations and planning for the Arts Midwest Conference. Her responsibilities include managing the registration and Spotlight Showcase processes and serving as the primary contact person for general questions about the Conference. Prior to joining Arts Midwest, Carly worked at the Fox Cities Performing Arts Center and held a position and internship at the Trout Museum of Art, both in Appleton, WI.